LOS ANGELES, Calif. - Andrew Dice Clay is on a roll. Or as the comedian sees it, enjoying a resurgence. He's in Woody Allen's latest movie, "Blue Jasmine"; will judge a new syndicated TV talent show and see his autobiography published next spring, and is collaborating on a documentary about his life and career with "Entourage" creator Doug Ellin. Add to that his guest shot on "Entourage" in its final season in 2011 and last December's Showtime standup special, "Andrew Dice Clay: Indestructible," and it sounds like a comeback for Clay, 55, after a fallow period that included a brief 2009 stint on "Celebrity Apprentice." He looks at it otherwise. "I've always done things a little differently," said Clay, who became both popular and polarizing in the 1980s with his profane, raw standup routines, especially those with women as the topic. Clay was so controversial — so misogynistic, angry detractors said — that his 1990 appearance as "Saturday Night Live" host prompted boycotts by series cast member Nora Dunn and scheduled musical guest Sinead O'Connor. 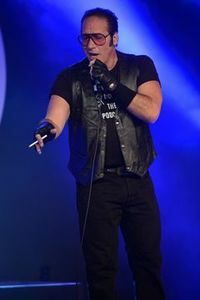 He hasn't lost his onstage edge, still essaying the Diceman persona that he calls the "ultimate rock and roll standup comedic hero," one that's equal parts swagger, black leather and middle-age pompadour. But Clay suggests that the culture is so altered that it's caught up with him, putting him in a different light. Women "have become the aggressors," he said. "When I say they're the most aggressive piglets ever, I don't say that with disrespect. I waited for this generation." In conversation, Clay is so polite that before he introduces a racy thought he assures the listener that it's part of his onstage material, not rudeness. He's eager to talk about his sons, Max, 22, and Dylan, 18, who Clay says took centre stage in his life after he went through a divorce about a decade ago. Both boys are pursuing entertainment industry careers and, together, have a band called L.A. Rocks. "I felt it was really more important to raise my sons properly than make career moves," Clay said. "I did the clubs, did theatre, but didn't make any kind of moves to have this resurgence until they were old enough." The Diceman as devoted dad? "My persona is one thing. Who I am off stage as a human being is really different," said Clay. He's a relative newlywed, married three years to Valerie Vasquez, 29 ("I'm crazy about her"). Allen spotted him on "Entourage," Clay said, leading to his role as a divorced blue-collar dad in "Blue Jasmine," which has been singled out by some critics (Variety called him "an especially offbeat and rewarding casting choice"). Clay, who's pursued both acting and standup, was so delighted by the chance to work with Allen and beside stars Cate Blanchett and Alec Baldwin that he agreed to let his hair go grey for the part. "I said, 'You don't have to ask me twice. I'll hate it, but if it's good for the movie I'll do it,'" Clay recounted. Next May, he's set to co-produce and judge "The Big Big Show," which Clay calls a cross between "American Idol" and "The Gong Show," and which will include his buddy Tom Green on the panel. Also scheduled for spring 2014 is his autobiography, "The Filthy Truth," from Simon & Schuster and co-authored by David Ritz, who's written books with Ray Charles, Etta James and Don Rickles. Clay just keeps going with the rollercoaster ride. "It's just been in me since I was young. I've never given up on who I am, I've never forgotten where I come from, Brooklyn, N.Y., or how I was brought up. My fighter inside me, my belief and my drive, never goes away."